Supersonic Sameday UK are experts in urgent same day deliveries. Your valuable goods will usually be collected within an hour of your call and rapidly transported safely to their destination. Your goods will remain on the same vehicle throughout their journey and benefit from being fully insured and secured from point of collection until delivery. This keeps the risk of loss or damage to an absolute minimum, offering you peace of mind. 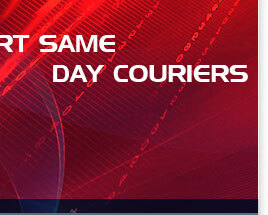 Supersonic Sameday UK are members of the largest same day courier network in the United Kingdom. This gives our business a dynamic extra dimension from which your business can benefit with access to over 2000 same day courier vehicles of all sizes. When your business is in need of an urgent Same Day Courier, call Supersonic Sameday UK on 0845 052 1596 for a fast, free, no obligation quote.